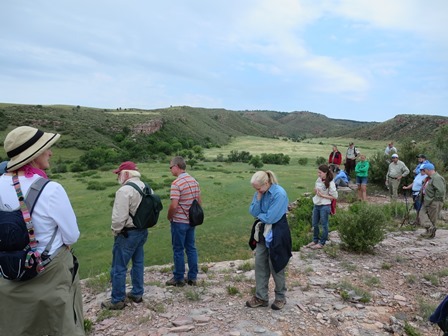 Recently I was able to join a Wind Cave National Park tour of the Sanson Ranch, including the buffalo jump. I highly recommend taking this hike, which is not difficult but leads to some spectacular country as well as providing a view of local history. The ranch is closed to public access [as of 2013] so you can’t go without a guide; inquire at Wind Cave National Park headquarters eleven miles north of Hot Springs off Highway 385 at 26611 US Highway 385, Hot Springs, SD 57747-6027; Visitor Information: 605-745-4600; Fax: 605-745-4207; or by email from the website, www.nps.gov/wica. The website provides hours of operation plus a special section on Sanson Ranch Information. The ranch is now closed to the public while planning goes on, but you can see photographs and other information. Carl Sanson and his family ranched this area for 105 years. Terrible weather, fires, and personal tragedies were just some of the many hardships he faced. However, like other ranchers, he cared for and protected the land and had many wonderful experiences during his lifetime. Carl said ranch life in the Black Hills was “next-year country.” If things were bad one year, he hoped for things to be better the next year. The Sanson family operated the ranch from 1882 until 1987. 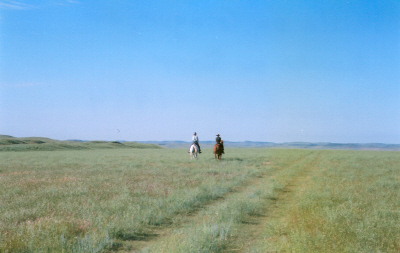 Carl knew about the tipi rings and the buffalo jump, although he admitted that his family’s farming operations disrupted some of the tipi ring sites. Hikers look over the edge of the buffalo jump to the valley below. The Sanson family owned this property from 1882 to 1987. It then was purchased by the Casey family. The Conservation Fund, a nonprofit dedicated to protecting important places across America, acquired the property at auction from the Casey family when it became available, and held it until federal funds became available to purchase it. The land is now part of Wind Cave National Park. Our walk took us from the Sanson family home and corrals uphill past a beautifully constructed root cellar and across a creek, avoiding the poison ivy and studying more beneficial native plants. We approached the buffalo jump by moving up a slight rise that hid the cliff from sight as the ranger described how the prehistoric Indians built brush fences and waved buffalo robes to make the bison run toward the hidden cliff. 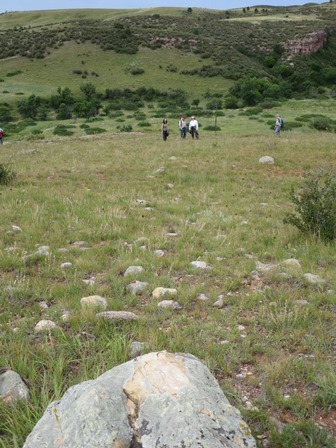 The drive lines are visible in the grass: long rows of stone aimed at the precipice. Standing at the top of one such drive line, looking down toward the cliff and the people gathered there, I could suddenly almost smell the bisons’ excitement and fear, hear the shouts as the animals fell over the cliff. Buffalo can, as Carl might have said, “spin on a dime and give you nine cents change,” so the Indians had to get the animals moving fast enough so that even if the lead animals sensed the danger, the weight and momentum of the running herd behind them would push them over. Being able to stand on a place where prehistoric man hunted, then where pioneers created a ranch while respecting their predecessors, is a powerful experience. I could hardly bear to look at the map depicting what the site would have looked like with houses. The buffalo jump “drive line.” The rock in the foreground is part of a guideline prehistoric hunters used to direct bison toward the jump. This is very close to the view bison would have seen as they ran towards the jump. The cliff edge, where the people in the photo are standing, is nearly invisible from this angle. I was especially happy to see Carl and his family recognized by the park service since Carl Sanson was a great influence on my life as a horsewoman. He helped advise a horse club that a friend, Mikkey Murphy, and I organized when we were teenagers. Patiently, Carl worked with a dozen horse-crazy kids, teaching us how to respect our horses as well as to get the best performance from them. 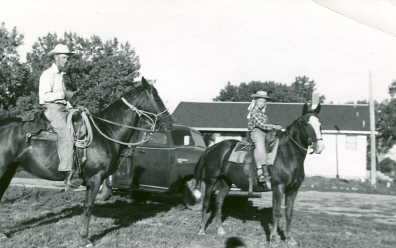 He also hauled our horses around when we were short of qualified drivers and stock trailers. My father, for example, believed horses were to be used for work rather than entertainment, so while he usually hauled my horse to the meetings, he wasn’t especially encouraging. 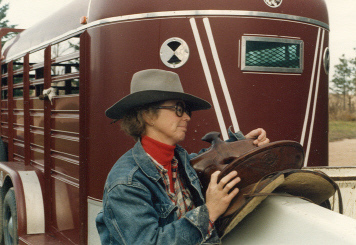 Carl understood that we teenagers regarded our horses as good friends and encouraged us to treat them as such. With the help of Carl, who probably drew on his experiences as a polo player, we devised a number of intricate maneuvers to execute at rodeos and fairs. The one I remember most vividly, because I was so badly injured while doing it, began when we lined up facing the audience in the arena. My friend Mikkey and I were on opposite ends of the line, carrying tall flags which we shoved in front of our boots in our stirrups, braced against our knees. Then we broke the line in the middle and each half rode toward the other. We had to be careful with spacing so each half of the line passed through the other. As the line of riders moved from a walk to a trot to a full gallop, the riders on the end, Mikkey and I, went faster than anyone else. So when, on one pass, we accidentally crossed flags, the impact nearly ripped both of us out of the saddle. Both of us kept our seats, but the slam of the flagpole against my knee hurt so badly I thought I might faint. Still, we completed our maneuvers and rode from the arena. When I eventually lowered myself from the horse, my knee was so swollen I couldn’t get my jeans down to look at the damage. Carl found some ice and packed it on to reduce the swelling. A doctor later told me I’d torn the knee cap loose and ripped some of the cartilage. This was the same knee my horse Oliver later tap-danced on, so it’s never been right since. But when any of us had horse wrecks, Carl was there to pick us up, dust us off and tell us– firmly but kindly– to get back on those horses. When his horse was gored by a buffalo roundup in Custer State Park, he stayed in the barn with the horse, night and day, doctoring its wound, until it recovered. Carl negotiated with The National Park Service to buy the ranch when he had to retire to a nursing home, but the deal fell through and the land was auctioned. Eventually, the owners decided to develop it– turn it into just another exclusive subdivision, destroying its history and culture, locking it up so that it could only be enjoyed– in a limited and shallow way– by a privileged few would might never have realized the cost of their golf course, swimming pool and home sites. But Carl, that generous man, wanted the National Park Service to have the land, so I find it especially fitting that the ranch on which he lived his rich life has become part of our national and state heritage. For more about Carl Sanson, read Jessie Sundstrom’s book Carl Sanson: Black Hills Rancher, published in 2009; it’s available at the visitor center in Wind Cave as well as at several other Black Hills locations.